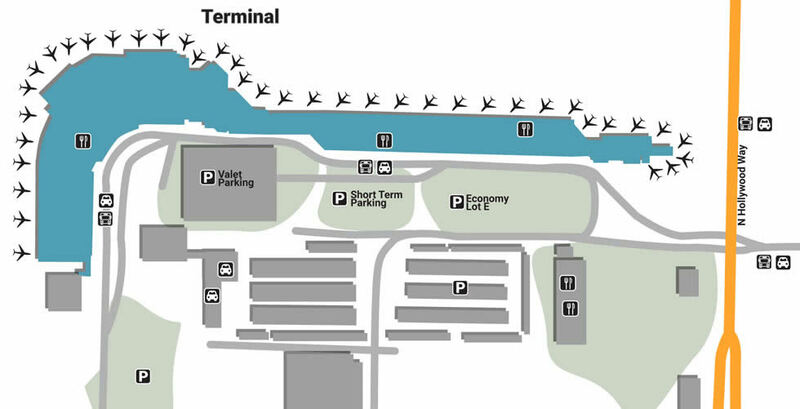 Once you get off of North Hollywood Way and are heading to your terminal at Burbank Bob Hope Airport you can use our maps to help get you towards your flight with a general understanding of the layout of the area. The beautiful city of Burbank, California feels exactly how you’d expect it to. Filled with sunshine and right by the bay, the city is a great place to find yourself, whether it’s for a weekend or a layover. As part of Los Angeles, there’s tons to see, from going on a stroll down Hollywood’s iconic Walk of Fame to grabbing a burger at the first ever Bob’s Big Boy. Wherever your heart decides to take you, know that the local Bob Hope Airport is there to help you get started. There’s plenty of parking at Bob Hope Airport, so much that you’ll easily find your terminal in a matter of minutes. Drop your keys off at Valet Center for an easy in, and be sure to join the Valet Parking Loyalty Program for unique rewards. Short-term parkers should head east to the Short-Term Lot for low rates and easy access to Gates A, C, and E. Enjoy the extra protection of Covered Lot G across the street, or stay long-term at Economy Lot E, located on the same stretch. Economy Lot C is a bit smaller and sits on the corner of Ontario Way and Thornton Avenue, however both long-term lots offer free shuttles to the airport. With a simple layout on one floor, Bob Hope Airport services make traveling run as smoothly as a bird taking flight. If you lost something important, head to the Lost & Found, located across from Gate B1. There’s a pet relief area located outside of B4, offering an easy outlet to de-stress. For those in need of a wheelchair, get one from Wheelchair Services, located beside Gate B5. If you’ve got a baby in need of a quick diaper change, or if you’re a mother that need to nurse, there are two Family Restrooms located at Gate A2 and A4. Kill some time by spending a few dollars where it counts, whether it’s for fresh makeup at Benefit Cosmetics, located between Gates A2 and A3, or one of many souvenirs and snacks at Hudson of Burbank across the way. Look extra glamorous by stopping by Hudson of Hollywood (B5), enjoying your surroundings by blending in with the latest sun dresses or cool shades. Get everything you need, from souvenirs to in-flight luxuries, by stopping by Pasadena Marketplace for exclusive Rose Bowl merchandise. Grab a fresh bagel and some interesting coffee brews at Peet’s Coffee, located near Economy Lot E beside Gate A6. Just to the left, near Gate A5, is Chezz Burger, a no-frills eatery that offers hearty lunches. Instead of giving yourself even more jet lag, try eating fresh instead, whether it’s from on-the-go grub at Lunch Box (Gate B4) or the natural ingredients at Fresco (A3). On the Terminal B side, there’s a small unnamed bar located across Gate B2 as well as another Peet’s Coffee by Gate B3.